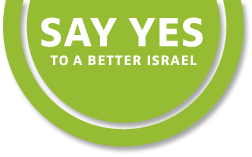 We're excited that you've decided to join us in helping to make a better Israel. Donations to New Israel Fund Australia are directed to our six chosen grantees, though if you wish, you can choose to direct your donation to any of NIF's grantees. Please contact us at info@nif.org.au if you'd like to do so. For each credit card donation, we are charged a surcharge of roughly 3 per cent. Please consider adding this amount to your donation to cover that cost for us. Alternatively, you can donate by electronic funds (bank) transfer. You can also view more information about the 100 Reasons campaign.